Instead of the five routes per year where DOT is currently planning to implement Transit Signal Priority, Levine's bill would mandate at least ten routes annually. Giving buses priority at traffic signals is one of the easiest and cheapest ways to speed up NYC’s sluggish surface transit network. But only five of the city’s 236 bus routes currently have “transit signal priority” (TSP), and DOT is aiming to add it on just 20 more routes by 2020. Council Member Mark Levine thinks the agency can do better, and he’s introducing legislation to compel DOT to ramp up the pace of installation [PDF]. City buses spend approximately 20 percent of their time stopped at red lights, according to DOT. TSP can shave that down by holding green lights for approaching buses and shortening red lights where buses are stopped [PDF]. Instead of the five routes per year where DOT is currently planning to implement TSP, Levine’s bill would mandate at least ten routes annually. The MTA is currently in the process of fitting its entire bus fleet with the technology needed to interact with the city’s traffic signals. The remaining costs are not very large. Implementing TSP involves spending between $1 million and $2 million per bus route, according to TransitCenter. 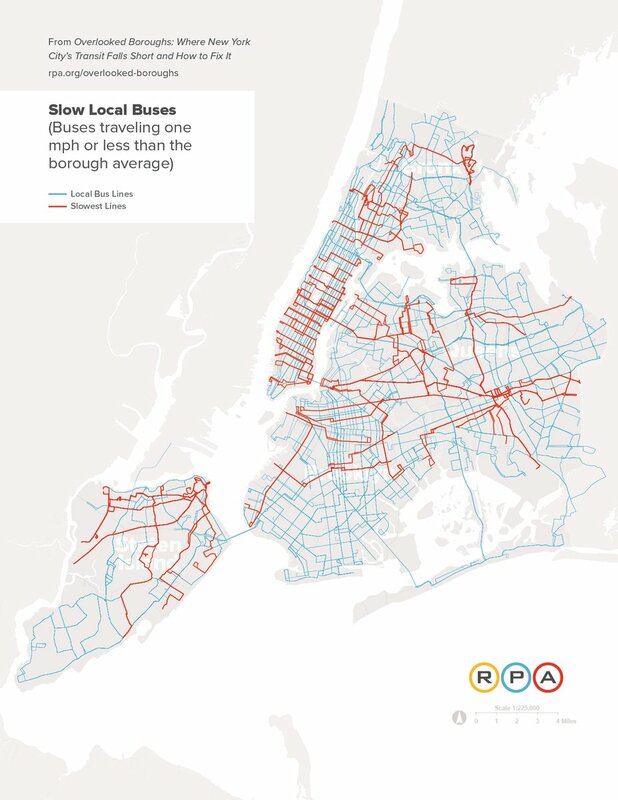 So far, signal priority has been limited to Select Bus Service routes, a small number of high-priority corridors where DOT and the MTA also implement off-board fare collection, bus lanes, and other measures to improve service. It makes sense to prioritize high-ridership routes, but there’s no reason the technology has to be limited to the specially-branded SBS corridors. Since last year, the Bus Turnaround Coalition has been calling on the city to expand TSP citywide. The city’s buses are the slowest in the nation and keep getting slower. Ridership is falling precipitously. Millions of New Yorkers who rely on buses can’t get to work, school, and other destinations in a reasonable amount of time. Last evening at a forum Levine said that Lhota called him to say he backs the bill. That leaves DOT. City Council members are putting some muscle behind the effort to get DOT and the MTA to speed bus service. Giving buses priority at traffic signals has improved speeds by an average of 18 percent on the five MTA routes where the technology is live, according to a new DOT report [PDF]. "Transit signal priority" (TSP) could reverse a citywide decline in bus speeds that has caused riders to abandon bus service in droves -- but only if DOT and the MTA apply it at scale. New York City buses are getting an extra shove across the finish line — er, intersection.